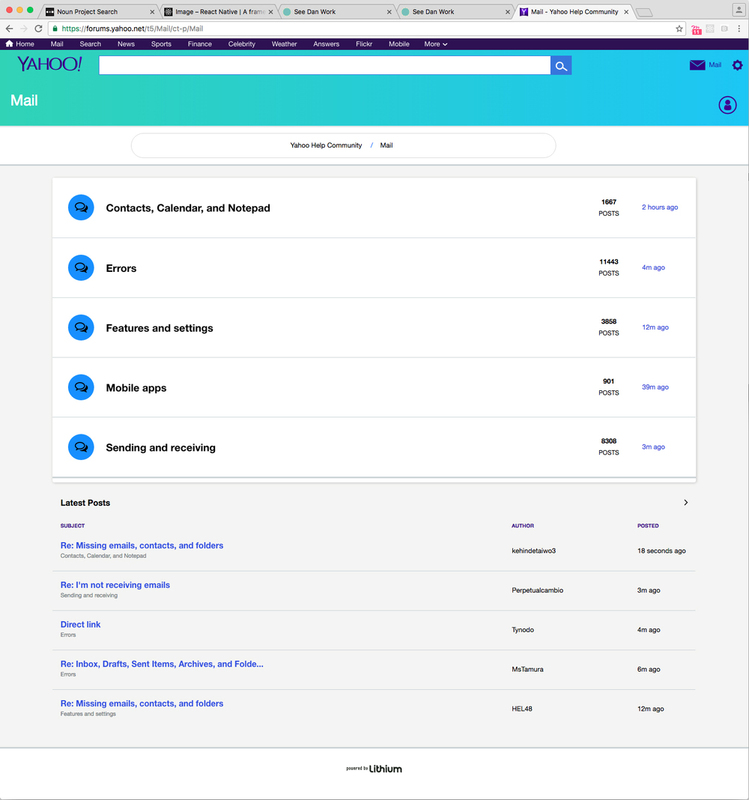 The combination of a high volume of users needing support and solutions for their Yahoo products in conjunction with a reduction in Yahoo's customer service agent workforce prompted the Yahoo Customer Experience Team to create a solution to help users self-resolve their issues. 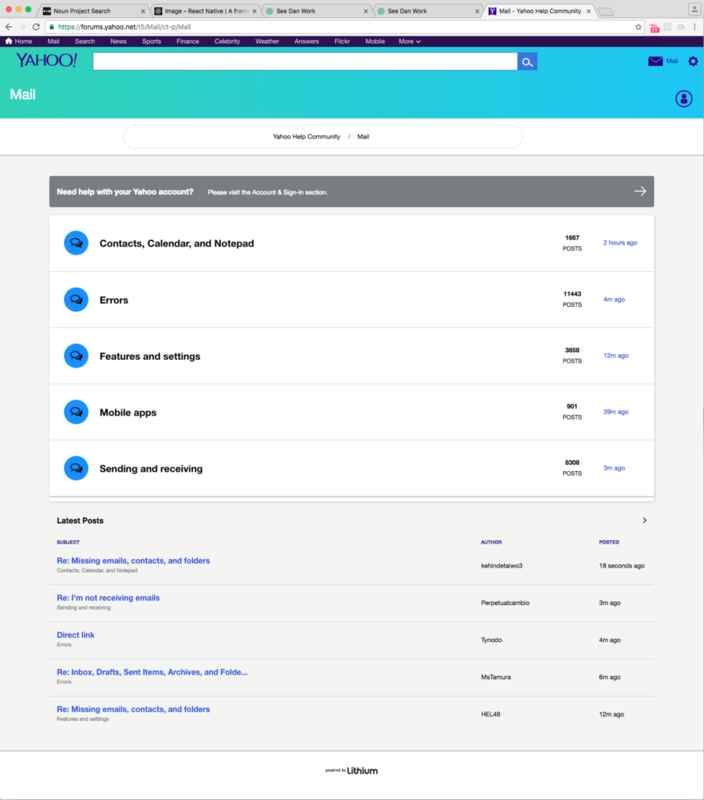 An online community of Yahoo product users, which in turn will create highly knowledgeable users who will be able to educate and assist other Yahoo product users. The designs did not reflect the new Fuji Design language of Yahoo. It did not prioritize functionality that would benefit a community of users (e.g. it heavily prioritized a search functionality that did not seem to be the highest priority). It did not showcase the content of the forums which would display conversations. It utilized a menu navigation that hid the depth of the website. The team responsible for the launch of the forums site consisted of a project manager, a community manager, and the business owner. The conversation initially heavily revolved around the aesthetics of the site verses the functionality and utilitarian experience. This led me to lead the conversation to be about information architecture, ultimately shifting the conversation into "how" the users use the websites vs "what" the users see on the website. 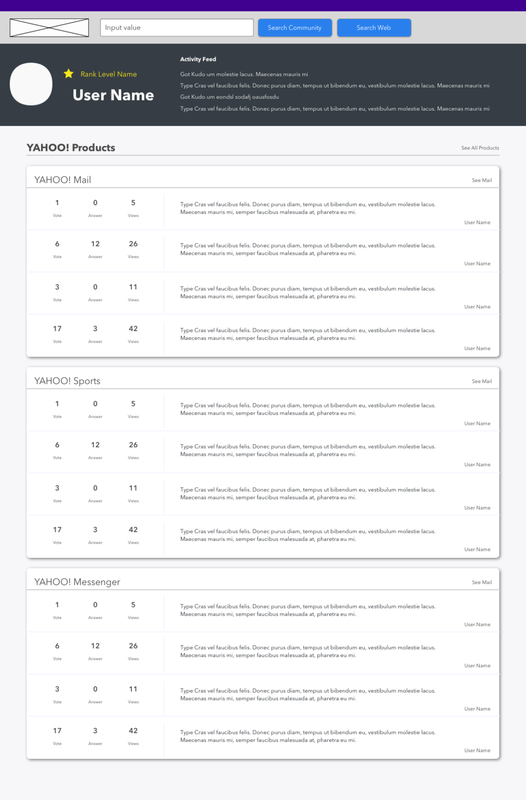 Architecture 2: Individual cards on the landing page where each card represents a separate Yahoo product, only showcasing three to four cards which represent the highest volume products. Architecture 3: A vertical column stream of globally (All Yahoo Products) trending topics regardless of product specification. Able to filter actions to narrow down preferences. Wireframes of Architecture 2: Card layouts where each individual card presents the conversations of the product. Wireframes of Architecture 3: A single stream layout with trending topics. Within a team discussion consisting of the business owner, project manager, community manager, and myself, the decision was to go in the direction of the individual cards due to historical evidence of Yahoo users being product-specific fanatics verses universal Yahoo product users. In other words, a Yahoo Sports user would most likely not be interested in the discussions and issues related to Tumblr or e-commerce. Architecture 2 focuses on conversations isolated by product groups. The final direction lost profile elements of the user, due to technical constraints of the tool utilized to build the site. The metrics showcased on the homepage show the most recent posts by product, but with a minimum amount of replies. This logic shows a frequency of new conversations and evidence of community feedback. On responsive mobile, the top level navigation minimizes into an off-screen menu. The menu is revealed originally through the clicking of a link with the text value of "See All Yahoo Discussions". To test the navigation and ease of finding desired conversations, 5 users were asked to test the desktop web version of the interface and then the responsive mobile version of the site. In the results, 4 out of 5 desktop web users were able to successfully navigate to discussions. For the responsive mobile designs, 0 out of 5 users were able to successfully navigate. 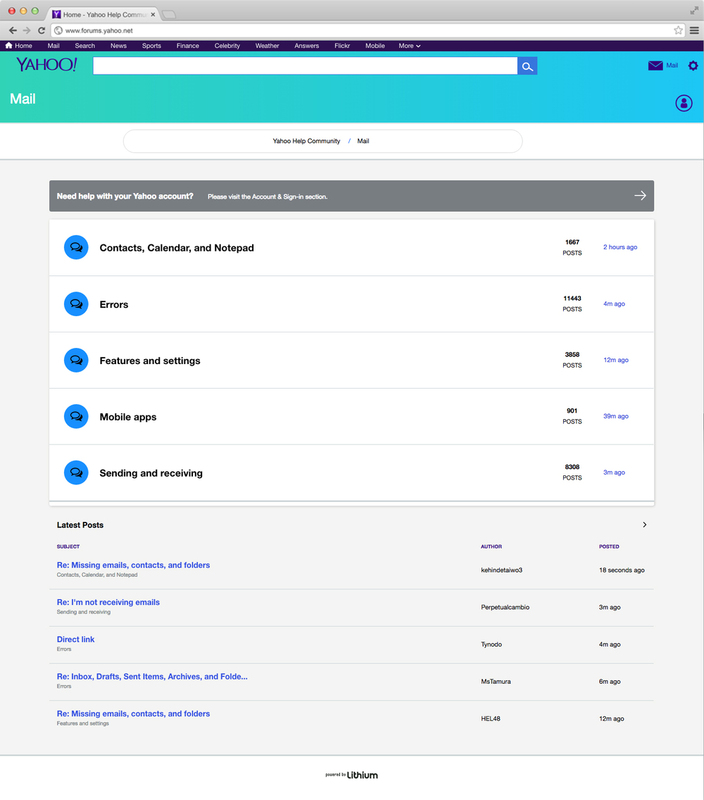 Thus, in the second iteration, a downward-facing chevron was added to the right of "See All Yahoo Discussions," bringing the final usability test to 4 out of 5 users being able to navigate to desired discussions. All Yahoo products require an account. Within the Forums page, conversations around users' accounts garner the largest amount of discussion. 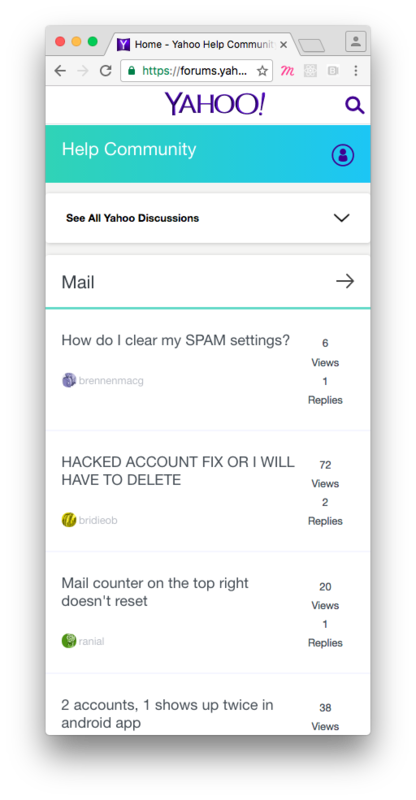 Since the architecture of the Forums.Yahoo page is broken into individual products, this means that the products could each have their own separate discussion boards around the topic of users' accounts. While this has some conceptual relevance, it does not meet the business requirements which does not have the man power to monitor multiple forums on account problems. Instead, a single Account Discussion Board was created with links from all products to join that discussion.